Back when I thought my size existed in the bra matrix (the incredibly insufficient A-DDD size range), I loved my Elle Macpherson bras. They're beautifully made with lots of pretty details and considering I wore mine out way longer than I should have, I can vouch for their durability as well. Once I realized my actual size, ~34FF/G I made my peace with never fitting into EM bras again. But when Florence of Science and Silicone posted a review of an Elle Macpherson bra I was elated. I hadn't realized they made sizes beyond DD! Now they only go from B-G cup so that's hardly inclusive, but since I fall at the tail end of that spectrum I thought I'd try out the Dentelle Underwire in 34G. I have had the hardest time understanding Elle Macpherson's sizing. Their tag says 34G (US/UK), which should be a red flag, since US and UK sizing are pretty different. But they also carry size 'FF', and generally US sizing doesn't double letters beyond D. Anyway, I digress, this bra is a terrible fit on me. When I first put it on I was immediately like "whoa, tiiight!" but quickly realized it's because the cup is too small. I have fairly projected breasts, but I don't think it's just the case that the style is too shallow (though I do think women with shallower breasts would have greater success. Possibly tall roots as well?) I also have very wide-set breasts, so usually I have no problem with the gore tacking to my sternum. This bra has the distinction of the first bra in my size range with a floating gore. The way the cup was constructed is unusual, and the lack of a side-panel on the sides to push my breast tissue to the front left them sadly splayed out and offered no shaping. Given the fact that I'm squeezing into what feels like at least one cup size too small, this bra is fairly comfy. Florence's review mentions the itchiness of the lace but it didn't bother me as much, so if you have super sensitive skin that's important to note. In the end, I wish this had fit! Mostly, I wish that EM were a D+ bra brand, since their bras are so gorgeous. But I will have to content myself with all the other beautiful bra brands out there that cater to my size (hard life!). 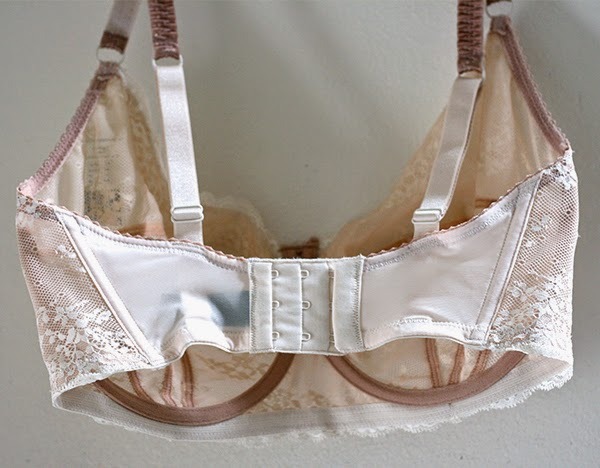 I haven't really found any D+ brands that have the same kind of super lacy romantic style that I swoon over. Gossard possibly? Have you tried Dentelle? I suspect ladies with shallower breasts and smaller cup sizes would love it! Hey, great review! Thank you for linking my original post in your post. Keep up the good work! Good start for your blog :) I hope you enjoy your journey! Gossard is a great brand but if you want to try them out, do it now as there will be no E+ sizes left soon. Thank you! Nooo I'm so sad they're phasing out E+ what a travesty! Your blog definitely turned me on to them, and I was able to get Lola and Phoebe in their recent sale. They fit so well, what a bummer.